To influence is to induce beliefs, attitudes, values and behaviours in other people by influencing their thoughts and actions through specific strategies. Influence is the science of understanding how people process information and the skill of presenting it in a way that causes it to be received, valued internalized and acted upon. Neuroscientists tell us that there is no such thing as objective reality. To prevent our brains from being swamped by the torrent of information that flows over us every day we have become masters of filtering. We absorb what our minds deem to be important and ignore the rest. This filtering process is controlled by emotions expressed as our values, beliefs and attitudes. We believe something to be true only if it is consistent with our strongly held beliefs. Reality therefore is only what we perceive it to be. Facts, in isolation, have no value. It is our personal belief that a fact represents the truth that makes it significant. In the process of personal development we come upon a new fact, determine if it is worthy of passing through our filter, reflect on its value and either incorporate or exclude it from our perception of truth. One of the most useful and widely applied tutorials on influence has been in the public domain for over 2000 years. The Greek philosopher Aristotle published the classic On Rhetoric around 350 BC. 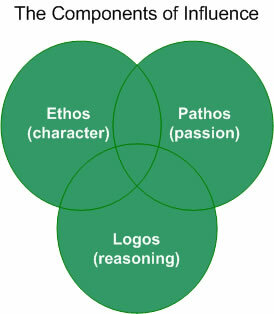 Aristotle suggested that a speaker's influence over his audience flows from the use of three essential devices: ethos (character), pathos (passion) and logos (reasoning). Ethos is character expressed as integrity, honesty, sincerity, credibility and demonstrated values. Human beings are highly judgmental. Primal forces drive us to classify everyone and everything, squirreling away out shorthand take on the world in our memory banks to drive subsequent conscious or unconscious evaluation and action. Within four minutes of meeting a stranger you will pigeonhole their character in some way. Are you honest? Can I trust you? Are you qualified to be an expert in my area? If the answer is "yes" your advice stands a chance of making it through the your audience's emotional filter. If it's "no" you may as well be speaking to the wind. Some ethos can be derived purely from reputation. Is there a software company chief executive who wouldn't want Microsoft's Bill Gates as a mentor? Reputation aside to exert influence you must also demonstrate ethos by your ability to provide relevant knowledge. Your character is also judged in a more general sense by the degree to which your actions are consistent with your words - especially when you are under pressure. Pathos is the passion you have for your subject and the empathy you have for others. Before you can persuade others to follow a course of action you need to transparently and passionately believe in it yourself. If you aren't personally convinced, your unspoken emotional queues will be picked up from your body language by your audience's social radar. I have a point of view that should be considered. Once you have negotiated these critical first steps of "belief" your audience will become much more receptive to your logical argument. The essence of Aristotle's argument is that ethos, pathos and logos must all be present to establish influence. For example, without first establishing ethos and pathos the most logical of arguments can be rejected. Feelings compel you to take action; logic is often applied after the fact to justify your actions. Maybe I should take his advice! In this way the "logical solution" (logos) has been wrapped around emotions (ethos and pathos) to create a powerful personal belief that motivates action. Why is the current state undesirable? Why is the new state highly desirable? What is the best means to get from current state to new state? The hook: provide a story or statement which arouses audience interest. The problem or question: pose a problem or question that has to be solved or answered. The solution or answer: present your solution. 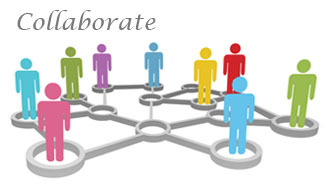 Benefits: state specific benefits to each member of the audience of adopting the proposed course of action. Call to action: propose the concrete actions which should follow your presentation.